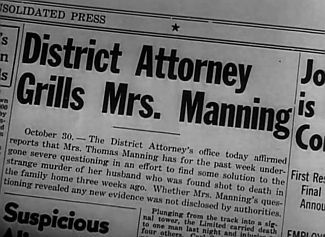 When Thomas Manning, the second husband of a wealthy socialite, is murdered in his locked study, the police are baffled and, months later, with the case at a seeming dead end, the district attorney decides to drop the case. Charlie Chan, who is spending a couple of days in San Francisco after having completed government work there before heading on to his next assignment in Cleveland, is approached by Manning's step-daughter Leah, who asks for help in solving the crime. Rumors, caused in large part by a book written by an eminent criminologist, Dr. Paul Reknik, have cast a shadow of suspicion both over her family as well as her love relationship with police detective Harvey Dennis who had been working on the case. While Leah and Chan carry on their conversation, a man secretly eavesdrops. Chan agrees to review the case, and despite his protests, number three son Tommy ignores his studies at the University of California to assist his father. 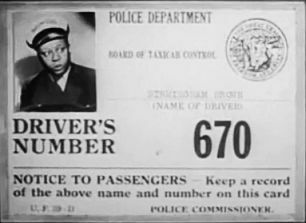 By chance, the detective takes a taxicab whose driver is Birmingham Brown, who had been involved in Chan's recent murder case in Washington, D.C. (Charlie Chan in the Secret Service). Brown, while terrified of danger and dead bodies, ends up chauffeuring the detective around town and assisting, in his unique way, Chan and Tommy with the investigation. 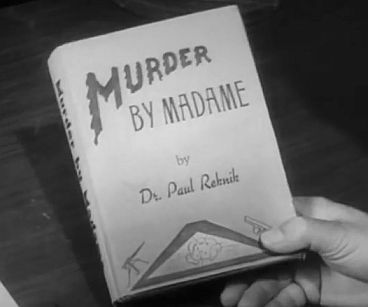 Chan and Tommy proceed to a book shop to purchase a copy of Dr. Reknik's book, Murder By Madame, which details the known facts of the Manning murder case, while presenting the conclusion that it was Mrs. Manning, Leah's mother, who had murdered her husband. While at the shop, the same man from the hotel lobby is tailing the detective and his son. The man, named Catlin, then returns to the hideout of a gang of jewel thieves which is located in a fun house at a pier amusement park. Catlin reports Chan's activities to the gang including Karl Karzos, whose twin brother Kurt, sneaks out and secretly sets up a meeting with Charlie Chan. By the time Chan arrives at the meeting location, he finds that Kurt has been strangled. Soon after, Detective Dennis, who had been alerted by Leah, arrives at the scene and identifies Kurt Karzos as a fence specializing in stolen gems. After Chan invites Dennis to join the investigation, the two men, searching the room, notice several loaves of stale bread with small Chinese statuettes inside. The next day, Chan pays a visit to Dr. Reknik to discuss his book and his theory, with which the detective disagrees. Chan comments that the person who killed Kurt Karzos wore gloves, noting that Retnik is wearing a similar one on his left hand. The criminologist explains that he wears it to protect a bad burn received in a fire. Leaving, Chan adds, "May interest you to know murderer of Thomas Manning also wore gloves." 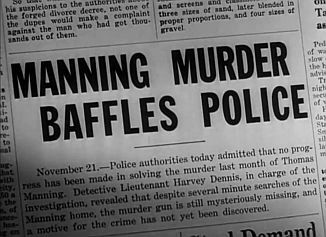 Chan then proceeds to the Manning house to examine the scene of the murder, which, he is told, has been left untouched since the police had made their investigation months earlier. While there, he finds a statuette matching those found at the scene of the Karzos murder. Chan also notes that something rather large has recently been removed from where it had been originally positioned on Manning's desk, as indicated by the absence of dust at that location. In another room of the house, after ascending a flight of hidden stairs, Chan is confronted by Manning's business partner, Webster Deacon, who vehemently objects to the reopening of the Manning case, claiming that it will hurt his business. As he leaves, the detective comments on the large diamond sported by Deacon on his ring finger. Returning to the study, Chan makes an exact tracing of the clean spot on deck. After narrowly escaping the explosion of a hidden bomb that was placed in Birmingham's taxi by the jewel thieves, Chan then visits the shop of artisan Wu Song. Chan is familiar with the artisan's work, and, as it turns out, Wu Song had indeed crafted the statuettes found at both the Karzos murder and in Manning's study. Wu Song shows Chan that each statue contains a hidden compartment, and as he opens one, a large diamond is revealed. The other two are found to contain diamonds as well. When Tommy casually notices a rather large statue of a cat, Chan keenly realizes its importance. Wu Song demonstrates that the cat statue also contains a hidden compartment. Chan then compares the drawing that he had made in Manning's study with the cat sculpture's base, finding it to be an exact match. Records show that a matching cat sculpture was sold to the Sea Tide Art Company. Chan visits Deacon at his office, and questions him about the Sea Tide Art Company which he owns. Deacon, pretending to get documents that prove he no longer owns that company, flees out the back door. While in the office, Chan and Tommy find another of the statuettes that had contained diamonds, but it is empty. Jumping into Birmingham's car, Chan and Tommy pursue Deacon to the pier where the Sea Tide Art Company and the jewel thieves' fun house hideout are both located. By the time they arrive, they find Deacon strangled. Chan, Tommy, and Birmingham return to Chan's hotel room. When Tommy passes out, Chan opens the door and discovers that someone has been trying to pump deadly oxyzone gas into the room through the keyhole. Deciding to examine the cat statue, Chan returns to the Manning house. After Mrs. Manning produces the statue, the detective opens the secret compartment, revealing a famous diamond that had been stolen the year before. Going to the fun house, Chan is captured by members of the gang who, knowing that the detective has the diamond, demand that he turn it over to them. When Tommy stumbles upon this dangerous scene, the thieves begin to pummel him, intending to coerce Chan into revealing the location of the diamond. At this moment, Birmingham suddenly appears at the door, and Chan shouts to him to run away with the diamond, thus convincing the gang that Brown has it. As the thieves chase Birmingham, Chan helps Tommy, who has been severely weakened by his ordeal, to hide under a desk in the gang's office. Chan then escapes. Detective Dennis, learning that Chan has gone to the fun house, goes there himself. In the meantime, Chan and Birmingham lead the gang on a chase through the fun house. Returning to the thieves' office, Chan and Birmingham take out two members of the gang, with a recovered Tommy coming out of hiding to finish the job with a well-aimed spray from a fire extinguisher. Dennis and Leah arrive, and Chan explains (so that Dennis will receive the credit for solving the case) that Manning and Deacon were partners in the theft of the famous diamond. When Manning had double-crossed the gang, keeping the diamonds for himself, Deacon killed him. To prove his supposition, Chan produces the gun that was used to murder Manning, bearing the initials "WD." Chan continues that Deacon had killed Kurt Karzos after descovering that he was about to betray him. 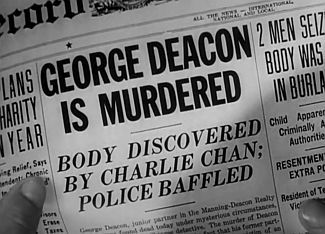 Chan then pulls the murder gloves from Catlin's pocket, concluding that it was he who had killed Deacon to prevent him from leading Chan to the hideout. 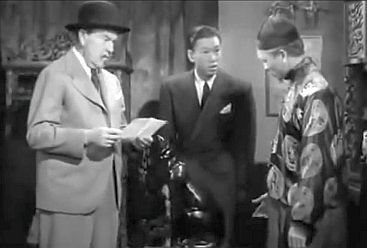 NOTES: This was Monogram's second entry in the Charlie Chan series. The onscreen title is listed as Charlie Chan in The Chinese Cat. The working title of the film was Murder in the Funhouse. The film's title, The Chinese Cat, is doubtless a "nod" to the 1941 Humphrey Bogart movie, The Maltese Falcon. Bull in china shop is gentle creature compared to detective who make pass at man wearing glasses. Expert is merely man who make quick decision - and is sometimes right. Fear of future is wrong for young people in love. Once you have large family, all other troubles mean nothing. Dog cannot chase three rabbits at same time. (Tommy: "Pop, I've got a case that will knock your hat off!") Can remove hat without assistance, thank you. (Tommy: "...Didn't I get you a swell case?") Every time you appear, I have swell case of assorted troubles. Tommy: "But, you've always said that two men can find a clue quicker than one.") Where is other man? Do not see other man. (Harvey Dennis: "We worked on it [the Manning case] for six months and got nowhere.") Perhaps I work little while and get somewhere. You are smart enough to keep eyes open? (Tommy: "You bet!") Do likewise - keep mouth shut. How you feeling? (To Tommy after he was overcome by gas) (Tommy: "My head seems to be spinning.") Then you're all right - everything back to normal. (Paul Reknik: "How are you coming along [on the case] to date?") Did not say which end of road I could see. THE STATUS OF TOMMY CHAN'S ALLOWANCE, ACCORDING TO CHARLIE CHAN: "...paid for next three months." THE "OLD FRIEND" MENTIONED BY CHARLIE CHAN: Captain Harvey Dennis of the San Francisco Police, father of Harvey Dennis, also of the San Francisco Police. Charlie Chan had worked with the former "years ago." CHARLIE CHAN'S BET WITH DR. PAUL REKNIK: $2,000 (at 10 to 1 odds) Loser to donate the money to "Chinese war relief." If Dr. Reknik lost, he would contribute $20,000. ANOTHER FRIEND OF CHARLIE CHAN: Wu Song, an artisan and owner of a curio shop in San Francisco. THE STOLEN DIAMONDS: Stolen from the "famous Kellinor collection" a year ago in Chicago. THE SUPPOSED RADIO MYSTERY SHOW THAT IS HEARD ON THE CAR RADIO BY BIRMINGHAM BROWN: Lights Out. Versions of Lights Out aired on different networks between 1934 and 1947. Lights Out was one of the earliest radio horror programs. THE NAME OF THE PUZZLE GIVEN TO CHARLIE CHAN BY SON TOMMY: "Battle of Algiers"
THE LOCATION OF THE DIAMOND SMUGGLING GANG'S HIDEOUT: The funhouse at Shore End Pier. THE TORTURE METHOD MENTIONED BY CHARLIE CHAN THAT THE DIAMOND SMUGGLING GANG USED ON SON TOMMY: "Third degree"
THE TIME, ACCORDING TO HARVEY DENNIS, THAT CHARLIE CHAN WAS TO MEET HIM AT THE MANNING HOME: "He said he'd be here by nine o'clock (p.m.)." 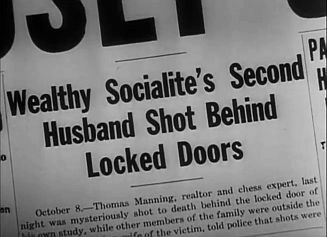 THE TIME AS HARVEY DENNIS AND LEAH MANNING LEFT THE MANNING RESIDENCE FOR THE GANG HIDEOUT AT SOUTH END PIER: 9:30 p.m. THE OFFICIAL CHARGES BROUGHT AGAINST THE DIAMOND SMUGGLING GANG ACCORDING TO CHARLIE CHAN: "Grand larceny and murder." 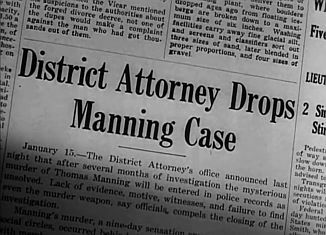 THE APPROXIMATE TIME OF THE SOLUTION OF THE MANNING MURDER CASE: about 10 p.m.
duck soup - An easily accomplished task or assignment. The Chinese Cat - Tommy Chan: "It'll be duck soup for a Chan!" flatfoot - (Slang) A police officer. Karl Karzos: "Chan's no flatfoot." flew the coop - (Idiom) Having fled or run away. Tommy Chan: "He flew the coop, Pop!" thirty-eight - A .38-caliber revolver. Dr. Paul Reknik: "There was no thirty-eight in it." jitterbugging - The performing of a strenuous dance to quick-tempo swing or jazz music and consisting of various two-step patterns embellished with twirls and sometimes acrobatic maneuvers. The Chinese Cat - Birmingham Brown: "A jitterbugging skeleton! Now I've seen everything!" oxyzone - A ficticious deadly gas. The Chinese Cat - Charlie Chan: "Oxyzone - very deadly gas!" third degree - Mental or physical torture used to obtain information or a confession from a prisoner. The Chinese Cat - Charlie Chan: "You see? Third degree not work."